I have been asked to blog about glass in the run up to the Open Studios week in Cornwall. It has been suggested to me that I blog about ‘Art of Glass’ – a how to guide about creating pieces of art from glass. The technique of creating pieces of art using glass. Wow, is all I can say to that. This could take forever. So how to approach such a request? Mmmm. Just the way I would eat an elephant (if I would ever eat an elephant) one bite at a time. 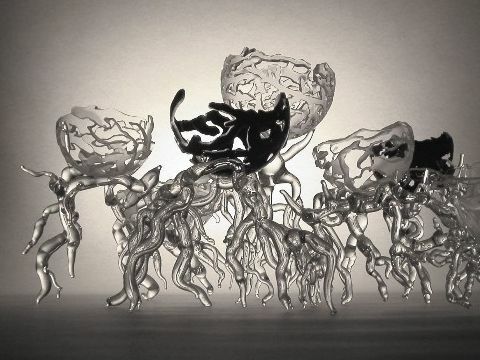 Glass Art can be made in a number of different ways. Fundamentally, glass can be made using hot glass techniques or cold glass techniques. Some say there is a third technique – warm glass. I am not one to argue with the powers that know so I am going with the three different methodologies here. Hot glass is the manipulation of molten glass picked out of a furnace at a whopping great 1000°C (yes that is right centigrade not Fahrenheit). See this wonderful video from the Corning Museum of Glass in New York State on glass blowing. Cold glass techniques work, unsurprisingly, with cold glass. Glass can be used in a variety of forms from flat glass sheets, through lumps or billets of glass, and all kinds of sizes and shapes in between. The glass is put into a kiln and the heat (anywhere between approx. 700°C and 900°C) is used to melt and manipulate the glass into desired shapes, often using pre-prepared moulds: A very simplified explanation, you understand. See here a video on shaping flat glass pieces in a kiln to make jewelry. Warm glass is the technique of manipulating cold glass in a flame to melt and shape it as desired. Yet another video, this time on making a glass sculpture in the flame. So in essence there it is – the three ways of making glass. The results of these three methods include and/or lead to traditional stained glass, sculptural glass, kiln-formed glass, glass blown vessels and sculptural work, beads and flame-work sculptural pieces, sand-casted pieces, and sand-blasted and engraved glass. Now how do I make my glass? You guessed it. I use all methods as I see fit and depending on the result I want. Of course, I am better at some methods more than others. I also have to take into account the cost of each method – hot glass is decidedly more difficult and decidedly more costly. And to be truthful I am decidedly a beginner when it comes to hot glass work. My favourite technique combines both cold and hot techniques, and is called the ‘roll-up’ technique. Although this was developed by the Romans, or the Egyptians, or Syrians – I forget who – this technique has more recently been re-invented by one of our Aussie friends Scott Chaseling (although I am not sure he can take all the credit for this as the technique is used by all sorts of people all over the world in reality).I cut flat 3 mm thick sheets of coloured glass (normally opaque glass), into 2mm strips. I them arrange these strips into my design, standing them on their edge like little toy soldiers. These strips are them put into the kiln and heated to 804°C in order to fuse them into a 2 mm sheet of glass which is A4 in size. The A4 sheet is then reheated in a kiln to 550°C, then the kiln is opened and the sheet is rolled onto the end of a blowing iron. At this stage the glass has softened sufficiently that it can be bend slightly around the blowing iron. The glass is reheated numerous times in the glory hole until it softens sufficiently to allow the sides to be folded around the blowing iron and attached to each other to form a cylinder. With further reheating the ends are squeezed in to form an enclosed space within the glass. This space forms the bubble that is later blown and shaped to whatever I want. This is how my pieces ‘Memories’ and ‘Inspiration’ where made.